Hewlett Packard - AW567B AW567B HP Modular Smart Array P2000 G3 Fc Iscsi Dual Combo Controller Lff Array System Hard Drive Array 12bay 2u Rack Mountable. New Retail Factory Sealed With Full Manufacturer Warranty. Hewlett Packard - AW568A AW568A HP Storage Works P2000 G3 FC ISCSI Dual Combo Controller W SFF Chassis. New Bulk Pack. Hewlett Packard - AW568B AW568B Hp Modular Smart Array P2000 G3 Fc Iscsi Dual Combo Controller Sff Modular Smart Array System Hard Drive Array 24bay 0 HDD Installed. New Retail Factory Sealed With Full Manufacturer Warranty. 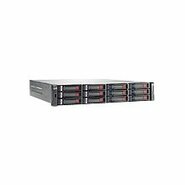 Hewlett Packard - AW567A HP/COMPAQ - STORAGEWORKS P2000 G3 MSA FC/ISCSI DUAL COMBO CONTROLLER LFF ARRAY(AW567A). NEW FACTORY SEALED. IN STOCK.SHIP SAME DAY.